Rangers' chances of signing Swansea forward Oliver McBurnie have received a huge boost with the cutting of his odds from at least two bookmakers to clear odds on. The Scotland international has been closely linked with Rangers for some time now and provided a further boost himself to the club’s chances of getting him with a gushing tweet about Allan McGregor’s own move north from Hull, but the bookies have followed suit with some offering 1/2 while others are slightly longer at 10/11. “There has been a lot of clubs interested in the summer, I have only got a year left at Swansea. We will look at it, look at the options and what is best in terms of everything." "McBurnie's spell at Barnsley showed a player who was ready to make the step up to a big club and Rangers look to have got themselves a steal. As a Rangers fan and young talent, Gerrard could hardly have made a signing to endear himself more to the Ibrox faithful." This one could well be on but time will tell. As it always does. 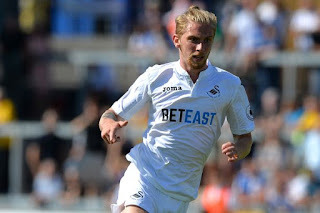 McBurnie & Bartley both instructing their agents to get them to Rangers is always a great sign of intent from both players, just a few hurdles to jump, Does Stevie want them, if so is the transfer fee doable. Wages not a concern for both. Yours trueley would certainly take them both in a heartbeat. McBurnie already one of Us. Bartley converted a long time ago. Rangers - a big club! ye can smell the FEAR! Any truth about will grigg? Me thinks both have been shabbily treated... Murty was never Rangers management material, if he had had any balls Miller and Wallace laying in wouldn't have been necessary. Imo it's disgraceful treatment of these guys. 1st of June so they can punt them both is the word on the street ma man! !